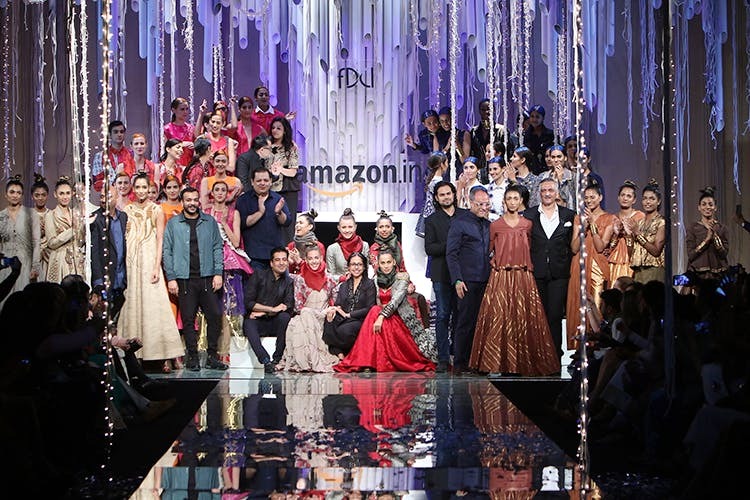 Amazon India Fashion Week Autumn/Winter ’16 more than delivered on strong design philosophies, concept-driven shows and undertones of drama. We enjoyed every minute and rounded up the best runway moments, so you can enjoy them too. Avant-garde vibes by Sanchita. We'd love to get our hands on those wigs. Everything gold at Rajesh Pratap Singh's show. Subtle, yet edgy. Fur detailing and metallic floral prints by Hemant & Nandita. Our favourite pieces? The brocade jackets. Abraham & Thakore’s off-site showcasing shimmering nymphs in earthy tints & shades. Monochromes, checks and a whole lot of playful nostalgia at Pero by aneeth arora. Their classroom-style runway did not disappoint either. Elaborate silhouettes and textile play by Amit Aggarwal. Androgynous chic at Dhruv Kapoor's show, with flashes of fur, leather and metallic panels. Layering game on-point by Lovebirds. We're drooling over those knits. We’re sorry the whirlwind is over, but now it’s time to shop!